David Gilbert. The Product of Our Souls: Ragtime, Race, and the Birth of the Manhattan Musical Marketplace. The University of North Carolina Press, 2015. In 1912 James Reese Europe made history by conducting his 125-member Clef Club Orchestra at Carnegie Hall. The first concert by an African American ensemble at the esteemed venue was more than just a concert–it was a political act of desegregation, a defiant challenge to the status quo in American music. 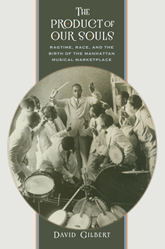 In this book, David Gilbert explores how Europe and other African American performers, at the height of Jim Crow, transformed their racial difference into the mass-market commodity known as “black music.” Gilbert shows how Europe and others used the rhythmic sounds of ragtime, blues, and jazz to construct new representations of black identity, challenging many of the nation’s preconceived ideas about race, culture, and modernity and setting off a musical craze in the process. Gilbert sheds new light on the little-known era of African American music and culture between the heyday of minstrelsy and the Harlem Renaissance. He demonstrates how black performers played a pioneering role in establishing New York City as the center of American popular music, from Tin Pan Alley to Broadway, and shows how African Americans shaped American mass culture in their own image.